PR might have some ACT's installed but they don't have LR versions, the first of those was only delivered mid November to Arkia and PR have been flying NEO's to Australia since July. Not sure if NZ have any ACT's installed on their NEO's (anybody know?? ), if they don't then the payload hit might be too much for them as it's about 5 tonne hit without them, but I still think this is about on board product rather than range. Yes my bad sorry I thought PR had LR’s for some reason. AKL-PER in a narrow body would be around 8 hrs similar to SYD/MEL-MNL time wise. NZ have ordered so far 7 A321’s and 6 A320NEO’s to replace the 13 A320CEO’s so a 1:1 replacement, NZ have 214Y seats which is a fair bit more than PR’s 2 class configuration. I agree in terms of product they want consistency aswell, would they make CHC-PER year round then with an A321 or did the article rule that out aswell? The longest AKL-PER flight this year has been 7hrs48mins. SYD/MEL-MNL does not suffer from the headwinds that AKL-PER suffer from either. Also there is a fair bit of cargo on flights between PER-AKL so I would also factor that in as well. Does anyone know of a QF plane being hit by a ground vehicle over the last few days. I’m convinced I saw it flash up somewhere when I was checking the web on my phone and I thought I’d look at it later in the day when I had time. Well it’s later in the day now and I can’t quite find anything on the news or AvHerald. Anyone know what happened (if anything happened that is)? You are probably referring to this. Not sure about winds, but AKL-PER is a fair bit shorter than MNL-SYD that PR flies with the A321neo regularly (though a lower density layout)... it would definitely be towards the end of its range though and may not be viable. PR do have ACTs as such the aircraft can’t handle containers and needs to be bulk loaded. As such I doubt the can handle much cargo - can’t see NZ being up for either as it would be a small sub fleet. My guess would be BNE-DFW and MEL-DFW (allowing the 789s to easily rotate through the system) with maybe a split of 3wk from BNE and 4wk MEL. I think BNE-ORD could be the other, allowing QF to get into the ORD market prior to project sunrise aircraft arriving (which would allow SYD-ORD direct). A triangular MEL-DFW-BNE-MEL would be a great addition. But my guess is that the first two new routes were intended to be MEL-SFO and AA LAX-MEL, and the third BNE-ORD which has been confirmed by AJ pending approval of the JV. They couldn't wait any longer to launch the extra SFO flights so went ahead with them anyway without AA. Surely this can't be serious. QF is apparently asking its head office staff to volunteer to man various airport roles as volunteers over Christmas/New Year period. I realise executives occasionally work in front-line roles to see how the systems really work but a business making over $1.6Bn a year asking for general staff to volunteer is strange behaviour indeed. My opinion would be different if QF were asking staff to volunteer to help with a Xmas Toy-Run or even staff a flight for needy kids but this is business as usual stuff where QF is charging top dollar over the busy holiday period. Here is the link, sorry it may be behind paywall for non-subscribers to The Australian. Last edited by tullamarine on Fri Dec 07, 2018 6:02 am, edited 2 times in total. Not having read the story (paywall) but, maybe management are just trying to show some goodwill towards front line staff over the holidays by working these shifts, allowing the normally rostered staff to enjoy the holiday with their families. If that is the case, good on them, excellent idea. 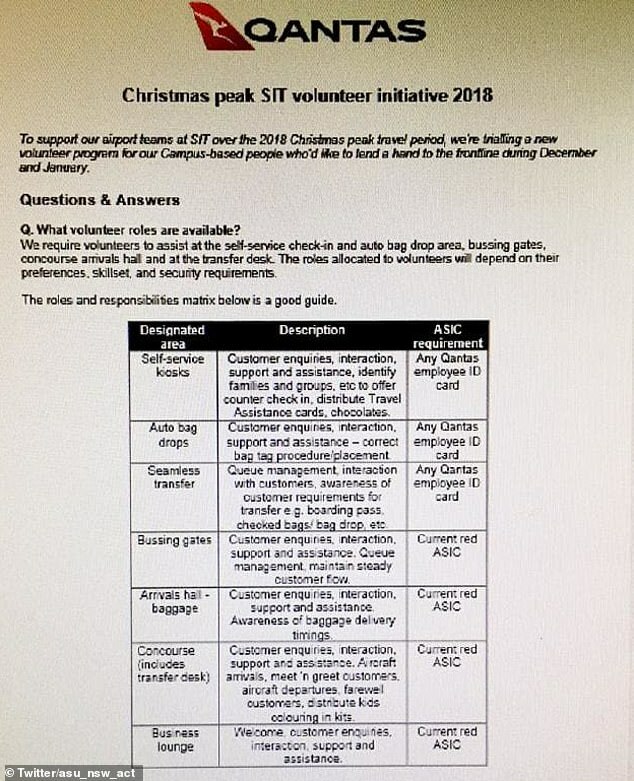 It's an offer to all head office staff (not just management) and you'd be right if QF were actually offering to pay the volunteering staff to fill-in for terminal staff but they are not. A non-paywalled article about the QF volunteer program. From what I gather, Qantas are wanting to do some marketing/PR activations at SYD international over the Christmas period, and want their staff to volunteer with this (with the offer of something like a gift voucher as a thank you for helping out). Plenty of businesses do similar, and they're often quite popular to do with staff as they get to do something a little different (as is this one from Qantas by the looks of it). They're not getting staff to take over doing the jobs of frontline staff. It's hardly the wage theft the ASU are carrying on about. There's a Garuda 737 looping around North Perth at the moment, anyone know whats happening? Anyone know why there are two Fedex Md-11's sitting on the cargo ramp today? Doubling up for Christmas season or something else? FedEx: FX have been operating two flights for a while now, one HNL-SYD and the other SIN-SYD. United: Definitely a one-off sub. SFO-SYD is stretching the range of the 788, although I'm assuming in this instance weight restrictions weren't a concern as they cleared three standby passengers. There are 10 open seats in the cabin, which isn't many, and I'd assume they would refuse standbys before ofloading cargo. They must have gotten very lucky with the headwinds. Apparently the flight was delayed out of SFO as they had to "resolve an unexpected operational issue". I'd say that the scheduled 789 went tech and after crunching the numbers realised that a 788 could make it today so subbed the aircraft in at the last minute. This isn't unusual in the Retail world. A few years back I was doing some last minute shopping at a Coles Supermarket on Christmas Eve. This store was next door to the Coles HQ in Melbourne, there were a good bunch of HQ staff helping out on the day. Was a good laugh seeing execs in office wear dragging out pallets of stock & trying to find out where to put it! Does set a good example to the frontline staff though, especially this time of year when they're getting slammed. Damned if you do. Damned if you don't !! A novelty for those volunteering with a bit of festive spirit. Those being assisted (well, most) would see it as a great gesture. start with a molehill, then a UNION gets hold of it, and turns it in to a MOUNTAIN LOL. Hopefully someones 'secret santa' at the ASU is a DICTIONARY...VOLUNTEER is in the 'V' section LOL. NO ONE IS BEING FORCED TO DO ANY 'UNPAID' WORK AND NO PAID WORKERS ARE BEING REPLACED/DISPLACED. Spin it however you like - this is a PR disaster for Qantas. A profit driven (and private) company that is beholden to shareholders asking employees to volunteer in their own time is just appalling. The majority of these staff would be salaried staff, so they are paid regardless, if they are wages staff, they are still getting paid for the public holiday anyway. They will receive a benefit from QF in some form, be it a gift voucher or similar. They are asking for volunteers, no one is holding a gun to their head to do it. I struggle to see how this is a disaster for them, unless they get too few staff to volunteer to do what they have planned to do, but they have probably already asked and they have the volunteer numbers they need. Again, they are volunteers, they don't need to do it, but the ones that do more than likely appreciate what they have planned as good P.R. for the company and won't hurt their own career prospects down the road and are quite happy to give something back. You know, some of these people may actually enjoy the chance to get involved in something like this. IMO this is bad PR for Qantas. Why ? Because we are in an age of unimaginable corporate wealth with stagnant wages. I get a feel there is a movement growing. Add in the ridiculous payments CEO's are getting and it's just not a good look - irrespective of any good intent. This guy [Geoffrey Thomas] is just unreal. Talk about talking up something that's not going to happen for a very long time, if ever. Speaking of which, we still haven’t heard anything about ANA starting Perth yet. I tend to remember the same newspaper announcing a couple of years ago that there was an announcement soon about PER-NRT flights. That certainly wasn’t the case. In saying that though, Japanese businesses are notoriously conservative in their approach, including the steps involved in decision making and approval. Given the news that this was to be launched in 2019, it could well be later in the year, so if that’s the case it would not really be in a rush to announce it. I wouldn't have a problem if they were volunteering to cover shifts and being paid at the same rate as the staff at the airport, they were just being released from HQ positions as they werent required or if they were there to carry out PR duties like the Westjet video but most of the duties listed are CSA duties the only PR type duties I can see are distributing chocolates and handing out colouring kits for kids. These volunteers would only be paid if their shift is under their normal working hours if not it would be unpaid - not a good look for a company announcing record profits. The volunteers would be taking away positions from CSAs that would normally be paid shift loadings, overtime or penalty rates to cover these shifts. Nothing in that e-mail indicates they're taking away shifts from paid staff. For starters, the office staff wouldn't be trained in frontline duties, and would therefore be more of a hinderance than a help if they were going to jump behind a check-in counter, or a gate counter, and perform the duties of a trained frontline worker. Most of the 'customer enquiries/assistance' will probably be side questions a passenger asks while they're getting water, or chocolate from the volunteer staff. If a QF staff member comes up to you offering chocolate, for example, it's a good chance to ask something like, 'Where's the nearest toilet?' or 'What's the best way to gate 43', for example. Or it might be something like having a couple of extra volunteers help people tag their own bags during queue spikes - something you don't need to roster someone on for a full shift, but something you could get a volunteer to do for 10 minutes while doing the PR activities. The volunteers will be complementing the frontline staff (which Qantas will already have stocked up on for the Christmas rush), not taking over their duties. Also, no one is being asked to do this for free. If they're on an award wage, they'll still get paid to help out. If they're on a salary, they're not losing any money by doing this, but might be able to bank a couple of hours of TIL to use later in the year by doing this. As I understand this 'leak' missed the all important 2nd page. Reportedly this has occured for a number of years without issue and a person I spoke to was surprised this had come up as an issue. It's also a period where airport staff struggle to get leave approved as many people want this time off so was generally seen as a win-win, as well as allowing staff to see the coalface. NZ does this every year in NZ. Most foreign carriers the locally management team will work the floor. This individual included! Even SACL staff, have to. Corporate side of aviation quietens down - not a good look sitting on your bum doing nothing whilst your floor staff run around in the busiest time of the year whilst the airport infrastructure and operation struggled to handle the pax volume. A quick search of social media and I’d say you would find most airlines in the US and EU are doing the same. The 20-24th are the biggest day of the year. Not sure if any one has been to SYD international during that time it’s manic!! Add in a disruption and it starts to collapse. SYDs baggage sortation system sTruggles every year and will stop for up to an hour. Again queue combing is required- perfect for non trained staff, let the airport team focus on the more technical elements of handling. t’s also when mostly leisure travel occurs, people who don’t travel often. So as pointed out questions spike, and people are stressed. To be honest they start to do strange things. Only limited leave is given away at Xmas, and without cancelling all leave there simply isn’t enough staff to cope with the volume of passengers. The airports team also have a life and will be willing to do so much overtime at Christmas too! This has been happening for years - Id even say every year! And corporate staff normally like to come out to the airport. Union making a mountain out of a molehill. the office staff wouldn't be trained in frontline duties, and would therefore be more of a hinderance than a help if they were going to jump behind a check-in counter, or a gate counter, and perform the duties of a trained frontline worker. They won't be behind a check-in counter or gate (that does require specific training and they systems are relatively complex) but what they can do is walk someone through the self-serve check-in kiosk process. This time of year brings out a lot of very occasional travellers who simply aren't used to the process of traveling. A shockingly high number of people can't work out how to use a relatively simply ATM-style interface, and giving them a hand with that along with general questions frees up actual trained staff to do their jobs. No wonder people are disillusioned with unions these days. Some head office staff can't actually do their day to day work during these periods as most companies shut down during the Christmas period. So why not volunteer to help out somewhere else? Handing out chocolates to passengers with a smile isn't what QF ground staff do anyway. I believe Air NZ and other companies ask their salaried employees to help frontline staff during busy periods. The headlines are just as bad as thought logic. WA Tourism met with Air India = "Flights to India coming". He's an idiot with a half baked website. Do you have more details of what easyJet do? I’m not saying they don’t do it just that I don’t know about it. A Par Avion BN-2 went down in a rugged part of Tasmania. Does anyone know how the loads have been on those AKL-NTL-AKL flight? They have asked head office staff to assist in the terminals during the busy periods and disruption. IMO this is bad PR for Qantas. Why ? Because we are in an age of unimaginable corporate wealth with stagnant wages. Contrary opinion, we live in an age of great individual wealth where individuals would rather spend many hours posting pointless pictures of themselves on the internet rather than help their fellow persons. Individuals are so much more selfish now and have little sense of community. Volunteering is a great thing. Its all about giving something back and not getting paid for it. Its completely voluntary, thats whys its called volunteering. Dont want to do it, you dont have to do it. There are so many brilliant volunteers who do contribute to the wider community - kudos to them. Get off your high horse and let the rest of the human race get on with doing what they want to do. Get off my high horse ? I made no mention of the merits of the program. All I stated was it was bad PR. Have you noticed the negative publicity this has received in mainstream media ? One can disagree with someone elses opinion without resorting to invective. Interesting article on new flight planning method by Qantas. Irops is different. This is Christmas. It happens every year. I've even known eJ open their head office up to passengers when Luton shut and staff have worked in the terminal when it's hit the fan but I've not known it be unpaid. Cant deny the evil genius in it. I think we are misunderstanding volunteered - these are Salaried employees who will be given the option instead of doing their normal 9-5 office job (which is quiet this time of year) can chooose/opt/select/volunteer if they wish to help their front line colleague/team on the shop floor.... or they can remain in the office and do 9-5.... I’d image they will need to consult with their manager first. They will be paid their normal salary regardless of what they choose to do. By volunteer it means heading out to the airport of your own free will- not unpaid. But yes they may not receive shift loading or allowances the airport team would- as they are salaried. This happens every year, at vast majority of airlines and airports- I would have thought this common in hospitality and retail too, managers downing emails and heading out to help employees during busy holiday period.I would be disappointed if it wasn’t. This seems like a good initiative to build engagement and collaboration - managers get to experience the peak period first hand.... yet union doesn’t want this? That seems sad to me. Just announced, QantasLink was I’ll be flying to Bendigo six days a week from Sydney, starting in March. This is a nice little surprise. As someone from Bendigo I honestly didn’t expect airline service for years yet. This is a very interesting addition and I hope it works out. I had to google where the airport actually is and from what I can see the main catchment area is Bendigo and it’s immediate surrounds. It seems that if you were travelling to Ballarat, Daylesford etc it would probably be more convenient to fly to MEL. BXG-SYD is early morning and SYD-BXG is late afternoon, clearly well timed for domestic connections from Sydney. Wouldn't be surprised if ADL starts within 12 months (there'd be a small, but decent amount of business traffic - given the Bendigo & Adelaide bank is HQ'd in Bendigo with its second largest office in Adelaide). Bendigo's got 100,000 people in its metro area, if you add places like Rochester/Kerang/Echuca (all north of the city) it makes the catchment a little larger, but yes, it's very much a service for Bendigo and its immediate surrounds. Ballarat (and Geelong) are closer to Melbourne than Bendigo - but I wouldn't rule out a progressive upgrade of Ballarat's airfield (like what's been happening at Bendigo over the past few years) to allow a regional service to Ballarat to start like the one Bendigo's now got. Ballarat's also got about 100,000 people in its metro area. That makes the metro area a similar size to Toowoomba. After the relative success of services to WTB it's good to see QF trying other comparable markets. SYD-WTB is 12 weekly (one service on Tue and Sat, two services on other days) so hopefully in time BXG can develop a similar level of service. Does BXG have security facilities to enable Q400 operations, or will it need to be a Dash 300 route? I tend to agree about Ballarat in the future. It seems like a natural expansion to take, building up the presence in both markets. This Bendigo service will be interesting to watch how it performs. Adelaide seemed like a slightly stronger case for service initially with the bank business links, but I am sure a Sydney service could also have a number of opportunities too.